Updated: Sept. 14, 2012 at 02:33 p.m.
Aaron Hernandez vs. Arizona Cardinals: A potential breakout candidate in fantasy land, Hernandez opened the regular season on a high note with six catches, 59 yards and one touchdown in a win over the Titans. Next on the schedule is a date with the Cardinals in what could turn into a blowout at Gillette Stadium. Hernandez, who has a chance to emerge into an elite tight end in fantasy land, needs to be active. Brandon Pettigrew at San Francisco 49ers: Pettigrew had 77 yards in the opener against St. Louis, but he could have had more had he not dropped several passes (including one in the end zone). Still, the fact that he was targeted 10 times (tied for the second-most among tight ends) is a good sign. This week he'll face the Niners, who gave up 10.70 fantasy points to Finley in last week's win at Lambeau Field. 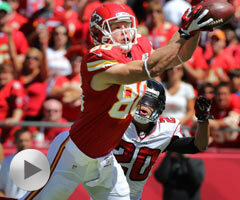 Jacob Tamme at Atlanta Falcons (Mon. ): Tamme and Manning hadn't played in a regular-season game together since 2010 before last week's win over the Steelers, but their rapport was still evident. The duo hooked up five times for 43 yards, including a 1-yard touchdown pass in the second half. That rapport, plus an attractive matchup against the Falcons, makes Tamme worth starting if you don't have an elite tight end. Coby Fleener vs. Minnesota Vikings: Fleener had a nice start to his NFL career, catching six passes for 82 yards from his former collegiate and current quarterback, Luck. This duo should continue to make sweet music together against the Vikings, who allowed 52 yards and 11.20 fantasy points to Marcedes Lewis in Week 1. Fleener is still a free agent in over 50 percent of current NFL.com leagues. Sleeper alert - Kyle Rudolph at Indianapolis Colts: Rudolph put up a nice stat line last week with five catches and 67 yards against the Jaguars. He had a total of seven targets from Christian Ponder, who should no doubt continue to look in the direction of this talented Notre Dame product. Rudolph, who is still a free agent in a ton of NFL.com leagues, is well worth a look if you lack a top tight end. Brent Celek vs. Baltimore Ravens: Celek was targeted eight times last week (tied for the sixth-most among tight ends), but he still finished with a modest 6.5 fantasy points in a win over the Browns. Next on the schedule is a date with the Ravens, who still field one of the toughest defenses in the National Football League. This unit allowed three receptions for 30 yards to the tight end position in Week 1. Dennis Pitta at Philadelphia Eagles: Pitta had a huge stat line last week, but his fortunes could change in Week 2. The Eagles allowed the fewest fantasy points to tight ends in Week 1, and have not allowed a touchdown catch to a tight end in six straight games. Philadelphia has also allowed fewer than 200 passing yards in five of last six games, which doesn't bode well for Joe Flacco for any of his receivers. Heath Miller vs. New York Jets: Miller had a strong start to the 2012 campaign, posting 50 yards and one touchdown in a loss to the Broncos. That ranked seventh among tight ends based on fantasy points. However, that was his first touchdown since last October and just the second time he has recorded 50 or more yards in his last eight regular-season contests. He's a risk against a tough Jets defensive unit. Tony Moeaki at Buffalo Bills: A talented pass catcher, Moeaki was considered a deep sleeper in some fantasy circles during the preseason. Unfortunately, his Week 1 performance (three receptions, 37 yards) left quite a bit to be desired in the stat sheets. Moeaki was also overshadowed by Kevin Boss, who finished with just under 10 fantasy points against the Bills. Keep Moeaki benched until further notice. Owners beware - Jason Witten at Seattle Seahawks: It's tough to bench a player of Witten's caliber, and it's not a move you should make unless you have a legitimate replacement. Just keep in mind that he's coming back from an injured spleen and was held to a mere 10 yards in the season opener. What's more, the Seahawks are very tough at home and field one of the more underrated defenses in the entire league.